Find secret yum cha delights in Spice Alley — if you can find it. Sydney's got a brand new Asian-inspired foodie alley, and chances are you might have walked straight past it. 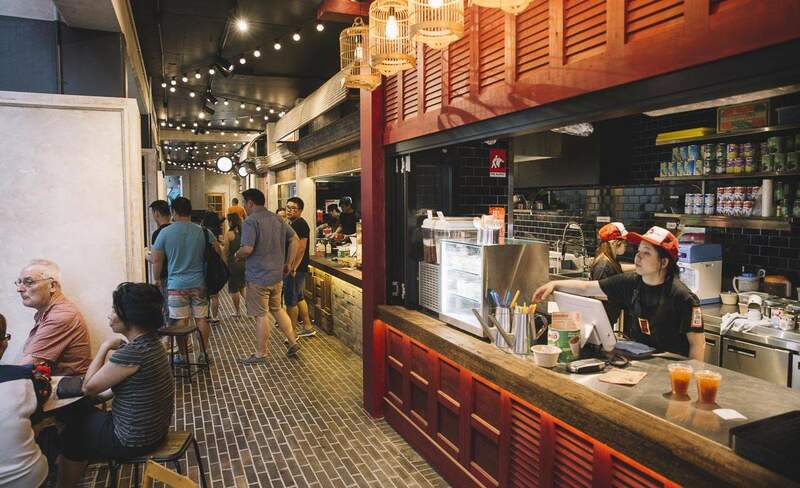 Hidden behind the brand new main facade of the Kensington Street precinct at Central Park, Kopi-Tiam Spice Alley is Chippendale's newest little food court. It's a pretty little corner of the world, decorated with lantern installations, but more importantly, there's a handful of damn fine food outlets in the space: Alex Lee Kitchen, Bang Luck, Old Jim Kee and Hong Kong Diner. Spice Alley is entirely cash-free — you can only pay with card or a special rechargeable Kopi-Tiam card — so let's load up and try the grub. Run by one of Sydney's most celebrated Singaporean chefs, Alex Lee Kitchen is your go-to for authentic Singapore dishes with a unique twist from the ex-head chef at Ginger and Spice in Neutral Bay. Next is Bang Luck, a hub of Thai and Vietnamese street food run by young gun Asian-Australian chef Tiw Rakarin (ex-Mama's Buoi, Surry Hills). Then we've got Old Jim Kee, home of authentic Malaysian dishes by veteran chef Jim Yong aka Uncle Jim, famed for his namesake restaurant in Mosman. Finally, there's Hong Kong Diner, managed by the team at Chef's Gallery and brimming with HK comfort food like dumplings and other yum cha morsels. Night Noodle Markets favourite POKLOL has also joined the party, doing their particularly modern style of Asian fusion alongside the Spice Alley core. Sydney's newest urban development, Kensington Street Precinct, is becoming quite the nosh nucleus of the Chippendale area. Following the opening of the highly-anticipated Old Clare Hotel, its reception bar and restaurants Automata, Silvereye and the upcoming Kensington Street Social to open in November, this shiny new street space is now home to some of Sydney's more creative culinary escapades. Find Kopi-Tiam Spice Alley behind Kensington Street, Chippendale. All stalls are open daily from 11am-10pm. Images: Bodhi Liggett, Lauren Commens.